The beauty drink Perfect Skin by DDr. Heinrich®, developed by the Viennese doctor DDr. Karl-Georg Heinrich, MD, maintains your beauty from the inside out. In his recipe DDr. Heinrich unites ancient cultural wisdom with current scientific knowledge. Perfect Skin by DDr. Heinrich® Beauty Powder allows you to create the flavor of your daily portion of beauty yourself and vary according to your preferences. Collagen and hyaluronic acid as well as specific amino acids are essential components of our skin and connective tissue. With increasing age our body produces less and less of these important substances. Consequently, our skin won’t regenerate in the same way as young skin does and it loses elasticity and tightness, wrinkles develop. Perfect Skin by DDr. Heinrich® Beauty Powder contains the components your skin needs to regenerate and remain radiant – a specially blended mix of peptides, amino acids and natural hyaluronic acid. 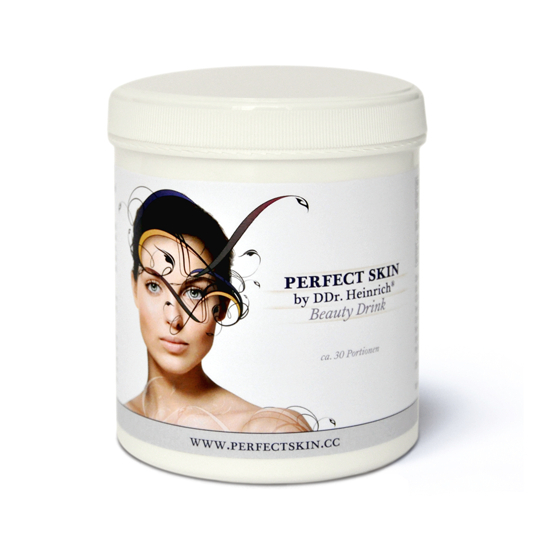 The Beauty Powder is free from sugar as well as artificial sweeteners, flavors, and preservatives. The application is simple: Perfect Skin by DDr. 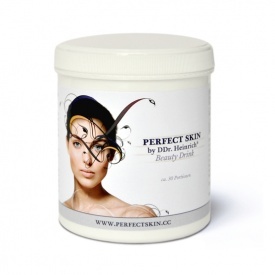 Heinrich® Beauty Powder can be mixed either with cold or with warm beverages to create your personal beauty drink. Mix 1 measuring spoonful once a day with a fluid such as soup, fruit juice, drinkable yoghurt, or milk, stir well, and drink. For best results, we recommend to take in one mixed serving of Perfect Skin by DDr. Heinrich® Beauty Powder daily. If the skin has already been severely damaged by sunlight and aging, or if the skin problem is caused by hormonal imbalances, additional medical treatments may be advisable. Skin rejuvenation with stem cells, growth factors, or platelet-rich plasma (PRP) and Hormonal Regeneration® with bioidentical hormones may be considered. Choi, S.Y., Ko, E.J., Lee, Y.H., et al. : Effects of collagen tripeptide supplement on skin properties: A prospective, randomized, controlled study. J Cosmet Laser Ther June 2014; 16 (3): 132–7. Epub November 18, 2013. Collier, S.R., Casey, D.P., Kanaley, J.A. : Growth hormone responses to varying doses of oral arginine. Growth Horm IGF Res April 2005; 15 (2): 136–9. Epub January 26, 2005. Fan, J., Zhuang, Y., Li, B.: Effects of collagen and collagen hydrolysate from jellyfish umbrella on histological and immunity changes of mice photoaging. Nutrients January 17, 2013; 5 (1): 223–33. Isidori, A., Lo Monaco, A., Cappa, M.: A study of growth hormone release in man after oral administration of amino acids. Curr Med Res Opin 1981; 7 (7): 475–81. Iwai, K., Hasegawa, T., Taguchi, Y., et al. : Identification of food-derived collagen peptides in human blood after oral ingestion of gelatin hydrolysates. J Agric Food Chem August 10, 2005; 53 (16): 6531–6. Kawada, C., Yoshida, T., Yoshida, H., et al. : Ingested hyaluronan moisturizes dry skin. Nutr J July 11, 2014; 13 (70). Oba, C., Ohara, H., Morifuji, M., et al. : Collagen hydrolysate intake improves the loss of epidermal barrier function and skin elasticity induced by UVB irradiation in hairless mice. Photodermatol Photoimmunol Photomed August 2013; 29 (4): 204–11. Ohara, H., Matsumoto, H., Ito, K., et al. : Comparison of quantity and structures of hydroxyproline-containing peptides in human blood after oral ingestion of gelatin hydrolysates from different sources. J Agric Food Chem February 21, 2007; 55 (4): 1532–5. Epub January 25, 2007. Proksch, E., Segger, D., Degwert, J., et al. : Oral supplementation of specific collagen peptides has beneficial effects on human skin physiology: a double-blind, placebo-controlled study. Skin Pharmacol Physiol 2014; 27 (1): 47–55. Epub August 14, 2013. Welbourne, T.C. : Increased plasma bicarbonate and growth hormone after an oral glutamine load. Am J Clin Nutr May 1995; 61 (5): 1058–61. Zague, V., de Freitas, V., da Costa Rosa, M., et al. : Collagen hydrolysate intake increases skin collagen expression and suppresses matrix metalloproteinase 2 activity. J Med Food June 2011; 14 (6): 618–24. Epub April 11, 2011. Zhuang, Y., Hou, H., Zhao, X., et al. : Effects of collagen and collagen hydrolysate from jellyfish (Rhopilema esculentum) on mice skin photoaging induced by UV irradiation. J Food Sci August 2009; 74 (6): H183–H188. Epub June 26, 2009.